This tool allows you to select a biology or human-use layer on an ESI map to query map objects to find out what they represent. 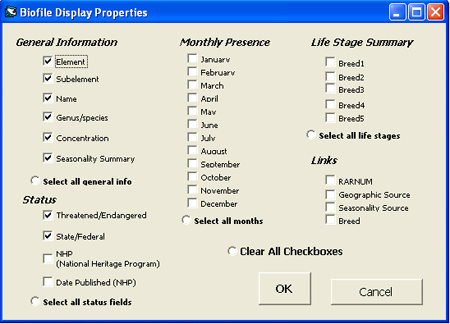 The tool provides a drop-down menu of the available biology and human-use layers in the ESI geodatabase. (At this time, you are limited to querying one layer at a time.) After a layer is selected, you may use the ArcMap Select Feature Tool or the Selection menu items to view the species (or the names and types of the socioeconomic and management features) that are present in a particular area. In addition, you can click the "Select the fields to display" button to access a form where you can select the fields of the biology and socioeconomic tables that you would like to view. Query by Location Tool [Zip, 45.9 KB]: Vs. 2, updated October 18, 2012. Note: You can download the entire suite of ESI tools for ArcMap from the ESI Toolbar page. The Query by Location Tool is in compressed format as a self-extracting zip file: LayerSelect.zip. [Need help with compressed files?] Once the file is unzipped, place the DLL file on your hard drive. For consistency, you may want to place it in the directory where most of the ArcGIS DLL files reside: ProgramFiles/ArcGIS/Bin. Note: If you are running the Windows Vista or Windows 7 operating system and are unable to load the Query by Location Tool using the following steps (i.e., you get a message that "no tools were added"), see the additional notes below. After you have saved the uncompressed LayerSelect.dll file to your hard drive, launch ArcMap. Right-click on the ArcMap toolbar and scroll down to "Customize" (or choose the "Customize" option under the Tools menu). Select the "Commands" tab on the "Customize" window. Click the "Add from file" button. Select the DLL file and click Open to add the Query by Location Tool to your available tools. Click OK.
To install any ArcMap DLL, you must have administrative privileges. The following approaches may be needed to successfully load the Query by Location Tool if you are running Windows Vista or Windows 7. Launch a new ArcMap session by right-clicking on the ArcMap icon and choosing "Run as administrator." Follow the steps provided above to load the tool. Once it is loaded, you can launch ArcMap as a user and the Query by Location Tool will be available. To use any of the ESI tools, you'll need to begin by moving the atlas directory that resides in the Geodatabase directory on your ESI CD/DVD (or that you have downloaded) to your computer's hard drive. The tools are dependent on the layer names and relationships that have been set up inside the MXD file provided. Click the tool depicting a fish and two map layers. You'll see the ESI Layer Select dialog box, shown below. A drop-down menu provides a list of the biology and human-use layers that are currently available to query. (These are the layers that have a relationship established with the ESI Biofile or Soc_Dat table.) Select the layer of your choice; you can only query one layer at a time. 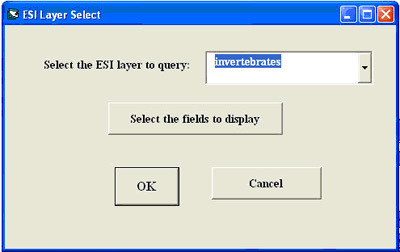 In this example, the Invertebrates layer is selected. Next, click the "Select the fields to display" button. In this example, the "Select all general info" option was chosen, which checked all of the General Information fields and two fields in the Status section. The General Information fields are Element, Subelement, Name, Genus/species, Concentration, and Seasonality Summary. (The Seasonality Summary field shows a monthly range for presence of the species--for example, January through October.) The two Status fields selected include species that are designated as threatened or endangered by the state or federal government. Click OK on the ESI Layer Select dialog box. You may now query objects on the layer you selected using either the ArcMap Select Features Tool, or one of the options on the ArcMap Selection menu. ESI Maps: Overview of ESI maps. ESI Toolkit: Tools and resources for ESI maps. Questions: Contact us with your questions, comments, or suggestions about the ESI Tools.